A page from the middle of When in Eternal Lines to Time Thou Grow'st . 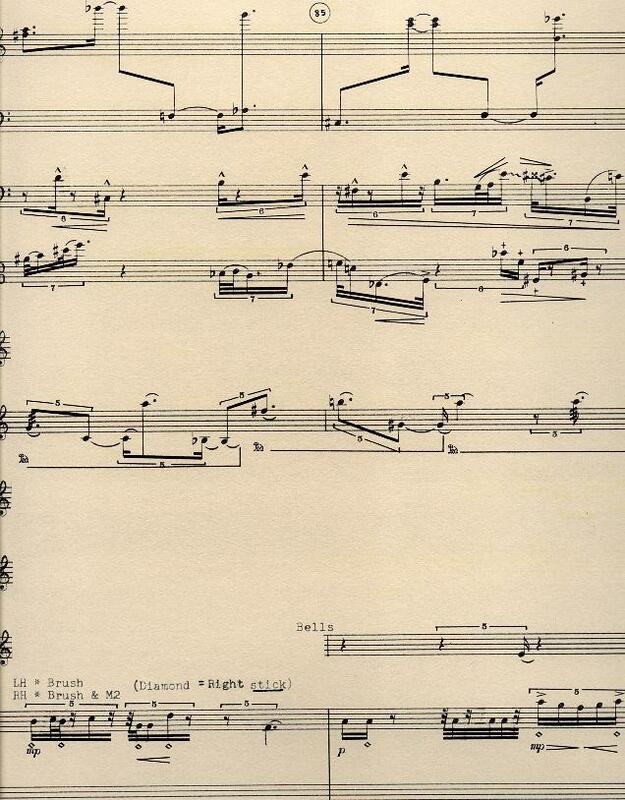 The instrumentation in score order is celeste, bass trombone, viola, electric mandolin, and three percussionists, two dividing a single mallets part, and the third playing a forest of 47 non-pitched instruments. The non-pitched percussionist for all three performances of the piece was Michael Ranta, who became my housemate for the summer of my senior recital. Mike was tall, thin, and lithe -- poetry in motion. He would play pieces like this by choreographing them, so there was an element of theatrical motion in his playing. I had to get his help in defining the instrumental setup, and in working out what was possible in some places. I took my cue in this from being with Sal Martirano during the realization of his theatrical work Underworld , for electronic tape with percussionists and string basses (two, as I recall). I sat in the percussion studio a couple of evenings and watched as he worked with percussionist Bill Parsons to assign the instruments to the rhythms he'd written. Notice the chopped off lines in the score. Simply dropping the lines when there were rests was in vogue for a while. I believe I first saw this done in Stravinsky's later music, but others did it as well. In this case, the masters are music typed onto transparencies, because that was how it was done in those days. Therefore, to get the desired appearance, when the master was completed, I had to go through with a razor blade and a ruler and physically chop holes in the score. I used to mail my originals to a place in Hollywood that reproduced music for recording studios. They would take the order, with a description of what you wanted, and would send you back the finished product with a bill. Life was sure different then. Naturally, they were thrilled to receive this package of doilies to run through their machine. They sent me a very kind note informing me that it was very difficult for them to do this work without turning my masters into shreds.